I remember Italy so fondly. 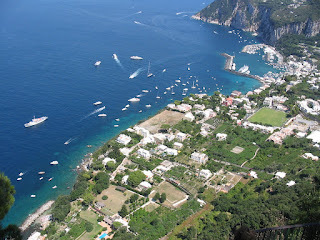 It was the summer after high-school graduation and the Italian club organized a trip to the land of my ancestry. The 10-day excursion hit all the highlights of the peninsular boot, including Rome, the Vatican, Venice, Florence, Sorrento and Capri. 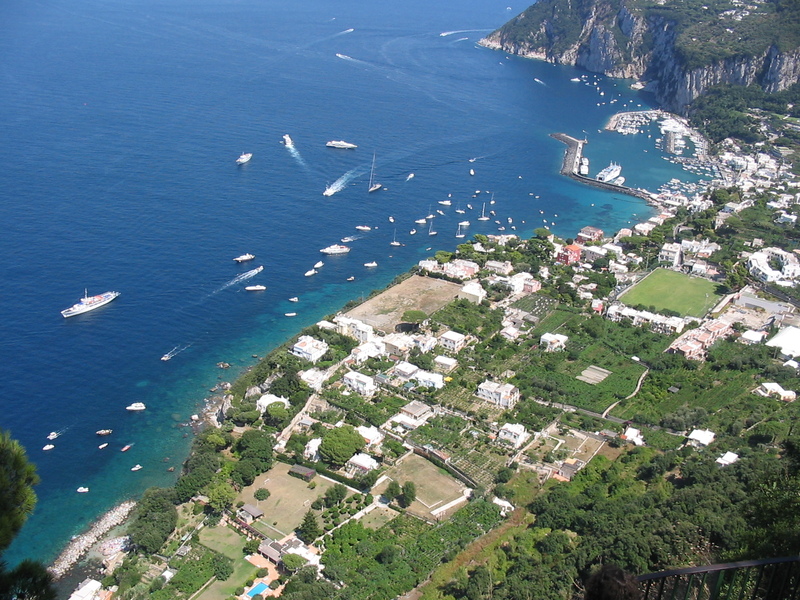 The destination that impressed me the most with its natural beauty was the island of Capri. We took a boat out over the shimmering turquoise waters of the Tyrrhenian Sea and went swimming off the rocky beaches. The beauty and splendor of the water that day would be remembered from then on in the choices of my aesthetic subconscious. From pens to shirts to the desktop background of my PC, I've tried to recreate the peaceful aqua blue that my mind gravitates toward. 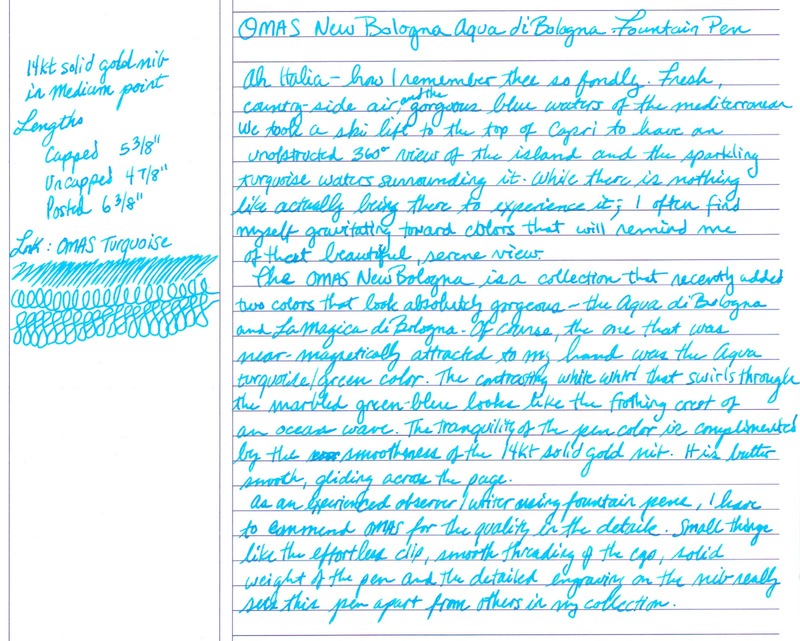 When OMAS introduced the New Bologna in the Aqua Blue color, I was convinced that this pen had been created to fill my personal need for this color to be in my life. The pen is turned from a solid bar of swirl acrylic that has a unique vibrancy and contrast that certainly reminds one of the crest of an ocean wave. The pattern of the swirls are unique and I have yet to find two New Bologna pens that look similar. Despite the pen body being solid resin with no brass inner lining, the pen is heavy, which is a testament to the thickness and the quality of the Italian resin. I feel that it would not easily crack or shatter if dropped. The solid metal front section, cap band, ring and clip certainly do add to the weighted feel as well. Before I go into the writing quality of the pen, I first would like to thank Kenro, the US distributor of OMAS, for being able to sell me the pen before an anticipated price increase that would have certainly broken my budget. I originally asked for a fine point (14kt), which is my go-to size for everyday writing, note-taking, journaling and such. I received a medium, 14kt gold nib in error. I'm not going to lie, I was a bit disappointed, but open to trying it out anyway. Turns out that the medium nib on this pen is fantastically smooth, probably the smoothest of my current collection of pens. I didn't want to ruin a good thing, so I kept it. After this pen, I developed the opinion that it is nice to have a few different sized nibs in your collection to offer some variation. The solid gold nib flows smoothly and fluidly, allowing for shading in most inks that offer a moderate amount of shading. The nib face is decorated with a design that is inspired by the porticoes of Bologna. The architectural design is well detailed and befitting of such a well-constructed writing instrument. The metal front section may be a bother to some writers, but I don't mind it because there is a lip to prevent slippery fingers from sliding down toward the nib area. The high polish allows you to spot any ink that may have gotten on the section from filling, which is a nice bonus. This pen would have been absolutely perfect if OMAS had installed an internal-filling piston mechanism, but I'll settle for the converter, which I've already managed to stain using Noodler's Kung Te-Cheng. This pen can be used to write while the cap is posted (posted length 6 3/8" long) without being unwieldy or back-heavy. The nib can be unscrewed from the section, similar to a Pelikan nib, making cleaning more convenient. The clip solidly holds on to your pocket or organizer pen loop without being too tough to attach/remove. The threading of the cap is smooth and extremely secure once tightened. Overall, the fit and finishing detail of this OMAS pen stands out to me as an understated quality that a layperson would miss, but a fountain pen user would certainly appreciate. One of my favorite pens in my personal collection, the New Bologna may not be my last OMAS pen, but I will have to wait quite some time to prepare the piggy bank for a celluloid paragon with a flex 18kt nib. Every time I take it out to write, it reminds me of Italy, which is something the manufacturer didn't intend, but is certainly a bonus that makes this pen more sentimental.